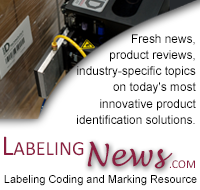 Oakland, NJ – Labeling Systems (LSI), powered by Pro Mach and a leading manufacturer of pressure sensitive labeling equipment, will be showing a new addition to their line of labeling equipment – the new Series 25 Label Printer Applicator – at Pack Expo Las Vegas, Booth C-2514. The Series 25 is the first LSI Label Printer Applicator designed to be PackML compliant and is ideal for packaging equipment users who want to get started with PackML in their packaging lines. PackML (Packaging Machine Language) is a standard for programming and controlling packaging equipment, intended to ensure there is consistency in the user interface, programming, and operation between the various packaging machines used in packaging lines. PackML simplifies communication between the different machines that make up a packaging line, reducing installation and training time on new equipment while making packaging machines easier to operate. The industry group OMAC (Organization for Machine Automation and Control), along with major Fortune 500 consumer goods companies and packaging machinery OEMs, has championed the advancement of PackML standards. The Series 25 Label Printer Applicator uses Allen Bradley PLC controls along with a 4-inch color touchscreen HMI and all operator screens meet PackML design guidelines. The Series 25 is a logical next step since LSI has many years of extensive experience building labeling machinery utilizing Allen Bradley control systems. Numerous applicator options are also available, making the Series 25 able to handle just about any labeling job. In addition to the Series 25, LSI will also be showing at Pack Expo the Model 22.62 Two Color Print & Apply Labeler designed for Global Harmonized Standard (GHS) labeling, the Model 1220 Track & Trace Labeler, and a cross section of their extensive portfolio of labeling solutions for the pharmaceutical, cosmetics, and consumer products industries. LSI is a division of Pro Mach, a leading provider of integrated packaging solutions and one of the packaging industry’s leaders in PackML – Pro Mach divisions will be showing over a dozen PackML machines at Pack Expo. Anyone interested in PackML will find it worthwhile to visit the LSI booth C-2514, as well as the other Pro Mach booths at Pack Expo, to learn more about PackML and what it can do for their business.